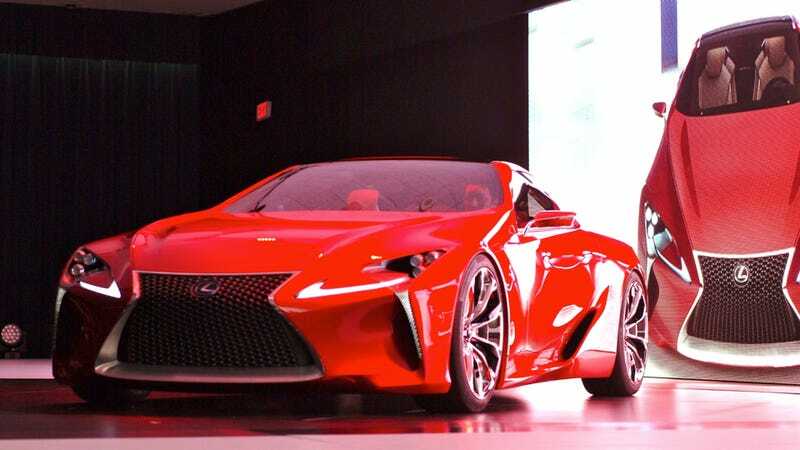 If you've already seen early photos of the Lexus LF-Lc concept you can stop reading. It's a styling exercise. Everything else is just fancy. Lexus isn't dumb and neither is the mothership of Toyota. They know the prior Lexus sports car wasn't sporty. It was maple and Ecru leather-trimmed accessory for the unstylishly wealthy housewife. A larger velour tracksuit. The brand is changing. They've got a halo car. Lexus is not just the vehicle of choice for the uncreative middle-manager grasping to understand success in the familiar confines of a slightly nicer Camry. That's most of the brand, but cars like the CT are bringing in a slightly younger feel. So what of the luxury buyer who can't afford a $500K LFA but wants a little sportiness in their lives? It's front-engined and RWD, which is good. It's also a hybrid, which is predictable. The LF-Lc could be it. Or, more specifically, a vehicle like the LF-Lc that gets rid of the unbuildable glass canopy and all the unsafe electronics. They'll never actually build this car.